If you take a look around the internet you’ll notice something strange has happened over the last few years. More and more businesses have began to realize the design of their website plays a huge part in increasing sales, and you don’t see a lot of terrible sites because everyone has stepped up their game. 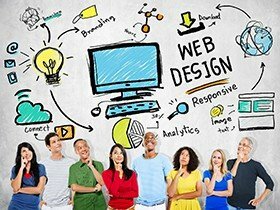 Website design is so important you’ll need to adapt, or all of your competitors will have an unfair advantage over you. If you don’t want your business to suffer you will need to make sure your site appeals to your customers, and we’re going to look at the main things that go into a great design so you know where you stand at the moment. Do you know how many websites the average person looks at on a daily basis? If they’re always online they’ll come across hundreds of websites per day, and they’re also smarter than you give them credit for. As soon as they land on your website they will know if you’ve thrown it together using a standard template, because it will look the same as thousands of other websites they’ve previously landed on. Your credibility will be thrown out the window before you have a chance to share your message with them and they’ll click away, so a custom website is the new standard for any business looking for as many customers as possible. Someone has landed on your website and you’ve caught their attention, but what do you want them to do next? A website should obviously be set up to allow the visitors to find anything they’re looking for before they get bored and leave, but you also need to take conversion rate optimization into account. That means carefully designing the navigation of your website so a potential customer will land on a page where they can buy something, and if they can do this within 2 clicks of their mouse you will make more sales. You have to decide what visitors should click on, and it’s a hard skill you must learn. I know you’d love to think website visitors will keep coming back to your site until they’re ready to buy something, but the truth is the majority of them will never return to your site. That means you need to force them to take action on their first visit if you want to take advantage of as many visitors as possible. You must have a call-to-action on all relevant pages, and even if you’re not wanting them to buy something on a specific page you still need to capture their email address. If you can build a list of potential customers and send them regular emails it’s the best way to make sure they come back. We’ve finally reached a stage where internet visitors are confident enough to buy things through their phone or tablet, and if you look at your analytics you’ll see how many people are looking at your site on a mobile device. Unfortunately the vast majority of businesses don’t have a responsive website design, so their visitors need to browse their site on a small screen. This is killing their conversation rate and they’re throwing away sales, but you can avoid the same mistake if your site is mobile-friendly. You must do something now because search traffic from mobile devices is only going to increase in the years ahead. Without going into too much technical detail that will leave you confused, your website needs to be coded correctly otherwise a number of problems might arise. Some of them have to do with your design and what visitors see when they open a page, but a poorly-coded website can also open you up to security issues and slow loading times. If a site has great code like the kind you’ll get with a custom build, it will keep the hackers at bay. Fast loading times also means less visitors will get bored and click away, plus your search engine rankings will improve as page loading time is part of the ranking algorithm. You must have a contact form on your website, because potential customers might need to ask you a question before they’re ready to get their credit card out. People also trust a company more if they have a phone number displayed on their site, so even though most people will never use it they’ll assume you’re a professional business. A number is useful when you’re selling expensive products, but even if you’re not your sales will be impacted if you don’t have a contact form, because who would buy something from a company if they couldn’t contact them should something go wrong with their order? Small business website design has to take content into account, and the reason it’s design-related is because of the way it should look. The typography you choose might not be crucial, but you need to choose a suitable font so visitors can read your content without squinting their eyes. The font size also plays an important role, along with things like quotes, bullet points, and images to break up the content making it easier to read. Your business should have a blog to get more search engine traffic, and all of these techniques should be used inside each blog post. While we’re on the subject of content, you must make sure you’re including relevant keywords. If you have a huge amount of content on your site you’ll get lots of traffic from Google, but only if you focus on keywords people will be searching for when they’re looking for your website. Long-tail keywords contain 3 or more words strung together and they’re easier to rank for, but you still want to go after more competitive keywords as you’ll start ranking for them in the future. You need to think of keywords as a long-term investment of your time, so don’t forget about them. Nobody wants to land on a site with nothing but written content, so make sure you appeal to their love of images. If you have a lot of quality images on your website you will catch the attention of visitors much easier. Rich media should also be used to make things interesting, and you can also use this to your advantage for things like collecting email addresses. If you have pop ups that appear when someone scrolls down your site you’ll collect more. Slider images are also useful depending on the type of business you’re in, but rich media can also be a distraction so it must be used properly. The last thing we’re going to look at is the colors you decide to include in your design, which is the final piece in the puzzle when it comes to building a professional-looking website. I don’t need to tell you why the colors you choose will attract or repel potential customers, but there is another thing you need to keep in mind. The colors in your design will become part of your brand image, and when people see those colors you want them to associate them with your website. That is why it’s worth taking some extra time to make sure you choose the right ones. Basically, Your Website Needs Everything! Every website design needs each of the things we’ve spoken about today if you want to stay one step ahead of your competition. Even if you get one thing wrong your business could suffer, so study them very carefully. If you manage to get everything right you’ll end up with a website your customers love, and you’ll ultimately make more money. So don’t skimp on your design because it’s not worth it when the competition is so high. Need professional website design services for your small business (hey, medium or large too!)? Let our team of design consultants help you! Just call 303-200-1000 today or by email at sales@seozones.com. We can build you a stunning design that will blow away your competition and your site visitors. We can even build you a custom design for your social media accounts such as Facebook, Twitter, and LinkedIn that will complement your website look and feel. This not only boosts your brand but it helps position your brand in the marketplace and gives you a stronger online presence across the web! Already have a website but not sure if it’s mobile-friendly? Go here to take the test and see!